NOW STREAMING: Lightning Over Water (1980). New York City, 1979. Cult Hollywood director Nicholas Ray is dying of cancer. Wim Wenders has a few weeks off from his production of "Hammett", and flies over to visit the dying man, whom he got to know when they made the film, "The American Friend". Nick's final wish is to make one more movie. And he sees an opportunity in his acolyte Wenders, who is more than happy to oblige. The friendship between the two directors seems genuine, even as they ride on each other's coat-tails in a symbiotic relationship that is a bit dodgy. Is Wenders taking advantage of Nick? Or is this a loving gesture? Should Nick expose himself in such a brutally honest way? One thing is for sure, it's got to be more gratifying for the old man than spending all night in his Soho loft, trying to knock shape into his artistic folly, the student-like mess of "We Can't Go Home Again", which he made with his students while teaching at a college in Upstate New York. 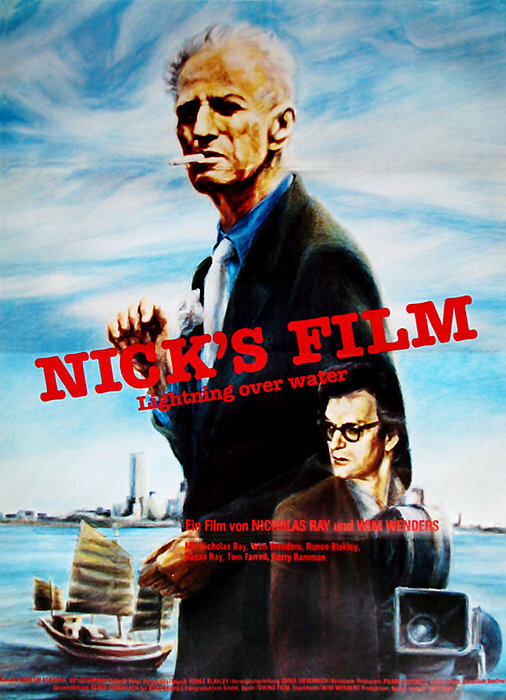 "Lightning Over Water" is shot on 35mm, and Nick can get a full crew to document his dying days. This is his last hurrah, his chance of regaining his dignity and self-image. Wenders needs Nick, and Nick needs Wenders. "Lightning Over Water" is an extraordinary film, a doc shot like it were fiction. Best bits are Nick giving a college lecture on his film, "The Lusty Men", and the final "wake" aboard a Chinese junk on the Hudson, with rice wine and Nick's ashes, and a movie camera with a film strip blowing in the wind. In one telling scene earlier on, Nick inquires about Wenders' budget for "Hammett". Wenders answers, "Ten million." Nick replies, "For one percent of that amount I could make... (long pause) ...lightning over water." And that is the difference between a fanboy director and a great director. watching somebody dying on film either strikes you as a good way to spend your time or it doesn't. I like Wenders' films in this period and this does sit rather snugly among them. he makes his point as he was wont to do. people die but movies don't.